Only the wood timbers are for this winter. If you look closely, you can see the flat aluminum mounting plates where the aluminum attaches to the timbers. These plates will tuck under the shingles and be fastened to the roof late very early this spring, if the weather cooperates. I forgot to mention that the sliding adjustment arms are a little funky right now. He had to switch to longer tubes since this was supposed to be mounted on an angled roof. You'll still need a duct take-off from the collector. Something like this perhaps? I know you don't have a Menard's locally, but you should be able to find something similar. OK, I understand now. I did wonder about the roof tilt. It looks like he is designing for collector tilt angle of around 60 degrees. The Flowtite adapter is another of the neat items not available at Home Depot. By the way, I'm not actively searching for fittings for the collector now in the works; I improvised with some 6 inch splice collars to go out the back (photos below). Just thinking about 'next time'. The tabs are glued and screwed to a 0.019 in. aluminum sheet that's siliconed to the polyiso back and fitted under the polyiso on the sides. Also - my apologies to Krautman, I didn't mean to hijack his project page. I have used all sorts of take-off duct connectors, but the Flowtite is just too cheap and simple to use if you want to connect to the back. And don't worry about jacking Krautmans build, since I'm pretty sure he would never sign up or even visit this site. But it does take away from info on your project build. Just a note, Craig told me yesterday he thinks the 1⅜" screen gap is too wide. He didn't elaborate, and since he still hasn't completely finished the final tweaking, I'm not sure what he is basing this on as it's producing heat unless he is comparing it to his first ZP. I'll have to inquire as to his specific reasoning. Question about the glazing assembly and the through-mounting bolts, described in posts 16-18: Do the bolts go through the glazing itself, or are they outboard? It looks like the bolts are very close to the edge of the frame. Maybe they go through the divider strips between the twin-wall sections? Probably the polyiso as well? I am looking for alternatives to the more 'conventional' method of screwing angle pieces into the sides of the frame to hold the glazing (which I did on my zero-pass). Krautman's method would seem to lessen the need something structural like plywood inside the frame, which you sort of need if you're fastening through the side. Krautman's frame doesn't have any holes in the sides, another plus. The application notes on the Palram site say drilling through the twinwall is only recommended for 'quick and dirty' applications. I'm not too proud to fall in that group, as long as drilling doesn't compromise durability or cause leaks. IF I were to drill the twinwall I think I'd drill the holes oversize to allow for expansion, put the bolts in from the back, and use body washers under the nuts. I'd try it on a piece of scrap first. You might still use aluminum angle, as it would spread the load out even better than body washers. At least on the top edge, it would help protect the seal as well. Sorry I missed your post. Not that it would have mattered as I would have had to check with Craig if he drilled holes, and he's been up in Canada fishing for the last month. That being said, I ran into him today and he said he did NOT drill through the glazing. He did, however, drill through the H-connectors, at the 4', 8', and 12' marks. The corners bolt holes were set right at the edge of the glazing. I don't like the idea of drilling through the twin-wall glazing. It's pretty near impossible to drill between the ribs, and if you hit one of the ribs, you have a potential leak point for water intrusion. Thanks Greg. I thought he may have drilled through the connector pieces, based on where the bolts were located. You have persuaded me it's not a great idea to drill through the twin wall (it didn't take much). I agree with Willie too - even if you did drill through, you should still have an angle covering at least the top edge, and probably all the way around. I got curious about it because I am thinking about a collector with no frame per se, just a polyiso box, glued and/or taped, and clad with aluminum flashing. I guess you would still need some sort of structural 'cartridge' to hold the internals in place. The biggest hurdle is the glazing - back to looking at clamp ideas. Never did solve that riddle last time. Craig(Kraut) wanted me to update you on the latest from his second ZP build. If you look back to the beginning of this build he ran out of time to mount the unit on the roof of his house so he built a massive temporary stand out of 4x4 and 4x6 timbers. The location was problematic in that the unit had to be mounted rather high to keep he shadow from the house off the collector. It also made for a couple of long duct runs into the basement. But the unit itself worked great other than the fact he was still using 6" ducts and as a result, he had trouble achieving the needed air flow to keep the output temps down. So the unit is now on the roof and the ducts are into the attic. Nice feature was that he used 10" solid ducts as a "cover for the flex duct insulation which covers the solid interior duct. So he has the insulation sandwiched between the two solid ducts. It looks great, and will certainly protect the insulation for many years. He's planning to tie the intake to the existing return on the second floor which is unused. So he will likely put in some sort of damper to isolate the duct run as needed. The warm, output duct will be routed to the basement beneath the main living areas. To do that he is considering using the hollow wall spaces. Not sure about that as the wall headers and footers will be in the way. He will be using two fans, with one being a small furnace fan, with a second fan being used as a booster that will only turn on as needed. His hope is to have the total CFM somewhere in the neighborhood of 550CFM in order to keep the output temp under control. Oh, he also wanted me to mention that even though he didn't end up making use of the two spring hinges for frameless screens shown below, he did end up using the spring hinges. Craig strung what was essentially a wire to one of the hinge holes, routed the wire to the opposite end of the collector and back and forth several times before being attached to the other hinge. This string of wires is VERY tight and actually strums quite nicely. 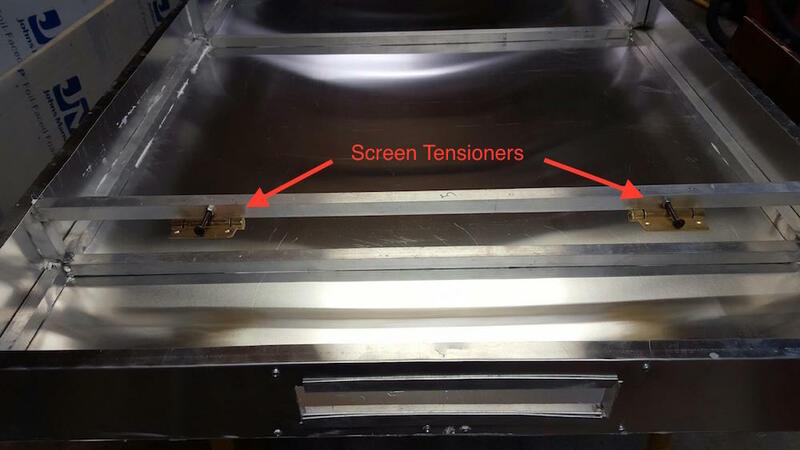 The purpose was to help support the upper hinge to prevent the screen from sagging over time. With the wire attached to a spring hinge at both ends, the wire should stay nice and tight. After all, who wants to go up on a roof pull off the glazing cover to do repairs. What if you strung a "grid" of wires across a collector box, say 2-3" apart, placed a layer of screen upon the grid, and secured the screen to the grid? The grid could be kept tight using springs to apply tension to the wire that is strung through eye-screws attached at the desired height of the screen layer. Or what if, instead of a grid, you attached a layer of chicken wire or hardware cloth at the desired height of a screen layer and placed a layer of screen upon the wires? A second layer of chicken wire or hardware cloth could be used to hold it in place and keep it from flapping. Configured like this and the screen could never sag, and would save precious space within the collector box. It would cost less than making a frame from screen frame parts, and be thinner and lighter than any wood frame could possibly be. Hmmm?